When I think of Fall, the first word that comes to mind is "cozy". For me, that means swaddled in a chunky knit, lounging by the fire, and snacking on countless warm cookies with milk. This is what I love most about the Fall. Baking a batch of cookies for a family get-together, an office treat, or just for fun on a Sunday afternoon immediately gives me a "feel-good" attitude. Have you ever tried crying while eating a warm. sugary cookie? You just can't. It's actually not possible. But... just, like picture that - it's a strange image to have in your mind. I came up with this recipe by literally just combining all of my favorite Fall foods: toasted pecans, toffee, and caramel. And it turned out aaah-mazing. I'm not kidding. Sam said that this is single-handedly the BEST dessert I've ever made. Now... that could be saying a lot for my baking in the past buuut, I'll let it slide if that means that I've now hit "pro" status (in his mind, at least). I'll let you guys in on a little secret - when I made these a few Sundays back, I didn't get a chance to shoot them because the sun had gone down before they were done and I actually didn't catch them in good lighting until Wednesday that week (blogger problems). So, when Wednesday rolled around, we barely had any cookies left to shoot (pictured is literally the leftovers) because we were snacking on them like crrrazy. I was like, "cookies for dinner?" Sunday, Monday, and Tuesday. So, if the recipe itself doesn't convince you to make them, just know that you're basically "food-prepping" your dinners for the week. #Responsible. Using a mixer, beat together the butter and sugar until smooth and fluffy. Gradually blend in pecans and toffee. Refrigerate for at least an hour. Roll rounded teaspoonfuls of dough into balls. Place on lined cookie sheets about 1 1/2 inches apart. To melt the caramel: Using a medium pot, boil water. Place a smaller pot inside the boiling pot of water. Unwrap caramel melts and place inside small pot. Stir on medium-high heat until completely melted. 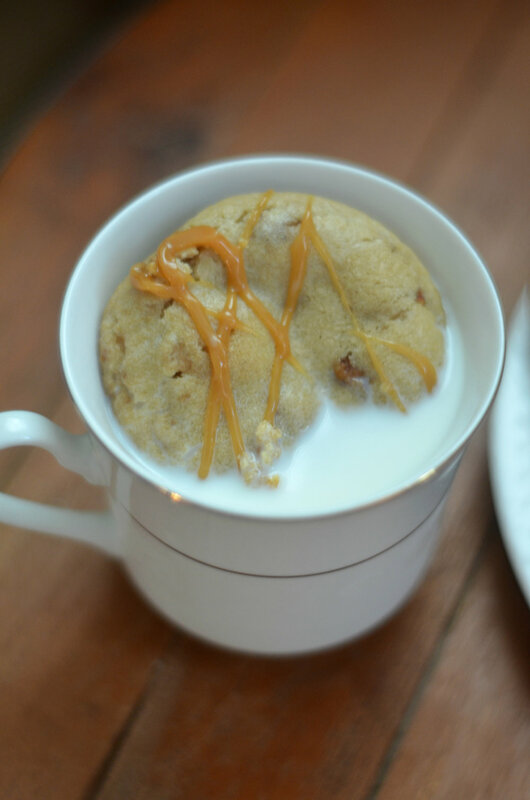 Using a spatula or spoon, drizzle melted caramel over cookies as desired. Let cool and enjoy! What recipes do you want to see next on the blog? Let me know in the comments below!